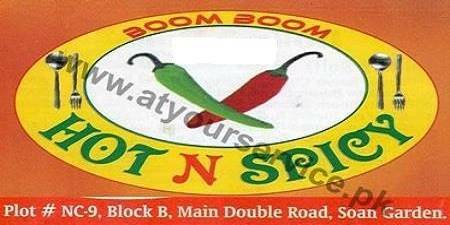 Boom Boom Hot N Spicy is a restaurant located in Soan Garden Islamabad. It offers chicken tikka, seekh kebabs and some other BBQ items. It also serves some traditional Pakistani food items such as chicken curry, qorma, daal (lentils), mixed vegetable etc. There is also a tandoor (chapati making oven) working at this restaurant. An inside sitting is available for 8 to 10 people. Outside sitting space in open air is for 12 to 15 people.